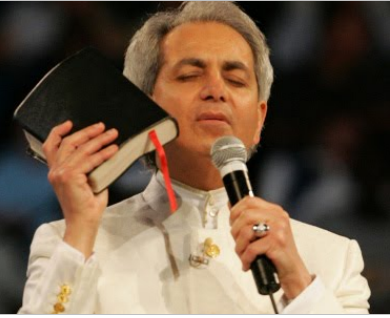 1952 (December 3): Toufik Benedictus (Benny) Hinn was born in Jaffa, Israel. 1968: Following the Arab-Israeli War, Hinn’s family emigrated to Toronto, Canada. 1972 (February): Hinn had a conversion experience whereby he became a born-again Christian. 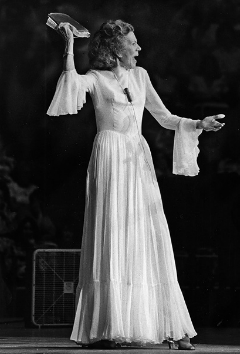 1973 (December): Hinn attended a healing service conducted by Kathryn Kuhlman in Pittsburgh, Pennsylvania. 1979: Hinn moved to Orlando, Florida, where he met and married Suzanne Harthern, the daughter of a local pastor, on August 4 of the same year. 1989: Hinn held his first nationally televised faith healing service in Flint, Michigan. 1990: Hinn’s television program, “This Is Your Day,” began airing daily on the Trinity Broadcasting Network. 1993 (March 2): Hinn’s ministry underwent its first investigation, conducted by Inside Edition, exploring the legitimacy of Hinn’s healing powers as well as allegations regarding the misappropriation of funds. 1993: Ole Anthony traveled to Orlando to conduct an interview with Hinn, during which he vowed to medically verify and authenticate all miracles prior to airing them on television. 1994 (June 10): Hinn “healed” professional and former World Heavyweight Champion boxer Evander Holyfield of a heart condition. 1999: Hinn handed over his church, since renamed the World Outreach Center, to Clint Brown and moved to Grapevine, Texas. 2001 (April): HBO aired an investigation of Hinn entitled A Question of Miracles . 2004 (November): The Fifth Estate aired a documentary titled “Do You Believe in Miracles,” revealing an ostensible misappropriation of funds as well as dubious healing practices within Hinn’s ministry. 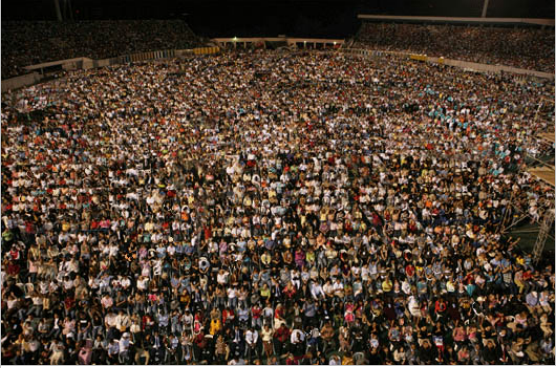 2007 (February 13-15): Hinn held the largest recorded faith healing service in history, the “Festival of Blessings,” in Mumbai, India. 2007 (November 6): U.S. Senator Chuck Grassley announced an investigation of six televangelists, including Benny Hinn, by the United States Senate Committee on Finance. 2013 (March 3): Benny and Suzanne remarried at the Holy Land Experience Church in Orlando, Florida. Toufik Benedictus Hinn was born on December 3, 1952 in Jaffa, Israel, a coastal city located in modern-day Tel Aviv, to a Greekfather and an Armenian mother. According to personal accounts, being raised in the Greek Orthodox tradition, he answered to “Benny” from a young age due to discomfort with having an Arabic first name. While little is known of his early years, he has written that despite being afflicted with an acute speech impediment during childhood, which isolated him socially, he was able to thrive academically at the College de Frere elementary school in Jaffa . 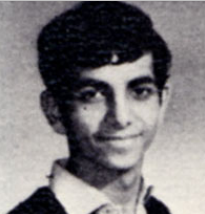 At the age of fourteen, shortly following the Arab-Israeli War of 1967 (also known as the Six-Day War) he, his parents, and seven siblings emigrated to Canada, settling in Toronto. While attending the Georges Vanier High school just north of the city, Benny became involved in a religious group that planted the seeds of his evangelical career. Attending prayer meetings regularly, where he occasionally taught the Gospel. Hinn “surrendered his heart and life to Jesus Christ,” becoming a born-again Christian in February of 1972. His parents feared he was becoming a “fanatic,” particularly after he dropped out of high school the same year (“About” n.d.). Shortly thereafter, Hinn underwent two more transformative experiences; the first occurred when he claimed to have received a divine appeal to minister the Gospel. The second occurred in December of 1973 during a trip to Pittsburgh , Pennsylvania where he attended a healing service conducted by Kathryn Kuhlman. Hinn claims that while on the pilgrimage, he was assigned to assist an elderly woman crippled by arthritis who, before his eyes, lost “all pain in her legs and ‘untwist[ed]’, as he put it (Bloom 2003:3). Recalling this experience, Hinn acknowledges Kuhlman’s influence in driving him toward faith healing. He would eventually author a book titled Kathryn Kuhlman: Her Spiritual Legacy and Its Impact on my Life, displaying an inspiration also apparent in his adoption of techniques used in her services, such as “her practice of ‘slaying in the Spirit’ and her use of ‘word of knowledge,’ both of which Hinn uses extensively.” Hinn has stated that Kuhlman has “appeared to him from beyond the grave to give him encouragement and ministerial direction,” although he never met her in person, and those familiar with the services of the two healers have noted a similarity in their manners of speaking, stage presence, and even choice of wardrobe (Peters 2009:1). Upon returning to Toronto with a crystallized mission, Hinn began preaching evangelical services on a local television program. The program’s success led him to expand his teaching to Orlando, Florida (“Do You Believe in Miracles” 2004). Hinn moved to Orlando 1979, where he met Suzanne Harthern, the daughter of a local pastor, and the two were married on August 4 of that same year. He founded the Orlando Christian Center in 1983; he developed and refined the structure of his self-proclaimed “faith healing” services, propelling him to international recognition. Throughout the decade, Hinn’s ministry grew steadily. He began conducting services in venues across the globe, eventually undertaking scheduled tours that he referred to as “miracle crusades” (Bloom 2003:4). His first nationally televised healing service aired in 1989 from Flint , Michigan , the success of which landed him a television show, “This Is Your Day,” which typically features, in addition to the reading of and responding to viewers’ letters, highlights from Hinn’s miracle crusades (Peters 2009). By the time he passed leadership of the Orlando Christian Center (since renamed the World Outreach Center) to Clint Brown in 1999, the success of “This Is Your Day,” along with that of his book, Good Morning, Holy Spirit (1990), had projected Hinn to levels of recognition unprecedented in his career. On his increasingly frequent crusades, he would fill stadiums and auditoriums capable of holding thousands of believers and skeptics alike, sometimes multiple times a day. Hinn had also begun to attract the attention and support of celebrities. 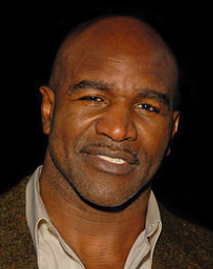 One of these was former World Heavyweight Champion boxer Evander Holyfield, who attended one of Hinn’s services in Philadelphia, Florida, seeking a cure for a recently-diagnosed heart condition that had endangered his career. At the service, held on June 10, 1994, Holyfield was invited on stage. After Holyfield described the nature of his disorder, Hinn reportedly laid his hands on him and, “in full view of the thousands of people in the audience, shook his head and told Evander that there was nothing wrong with his heart” (“You are healed…” 2011). Shortly thereafter, Holyfield underwent an extensive series of tests at the Mayo Clinic, which determined that rather than having been born with a heart condition, the complications had arisen from improper medication following his last fight, but that it was nonetheless a miracle that he had survived and healed so quickly. Holyfield subsequently reimbursed Benny Hinn Ministries with a check for $265,000, and he has spoken out in support of Hinn on multiple occasions. Following Hinn’s resignation as leader of the World Outreach Center in 1999, he and his family relocated to Grapevine, Texas. On February 1, 2010, Hinn and his wife, Suzanne, filed for divorce, citing “irreconcilable differences.” However, when brought together at a family reunion in 2011, the couple began to settle their disagreements, and the two were remarried at the Holy Land Experience Church in Orlando, Florida on March 3, 2013. They settled in Southern California, “strategically near the ministry-owned television studio and church in Aliso Viejo” (“Benny Hinn Author Profile” n.d.). The doctrines that Benny Hinn professes in his ministry are eclectic and unsystematic as they are a drawn from various individuals and variants of Christianity. Hunt (2000a:74) characterizes Hinn’s ministries as constituting “almost a `movement within a movement’ and have their own style and ethos, beliefs and practices that are exemplified by the `health and wealth’ gospel which, in many respects, is congruent with contemporary cultural values.” The ministry has also been described as Evangelical “on the fringe of Pentecostalism” (Bloom 2003:2). In developing his distinctive theology, Hinn has often made claims that he asserts stem from Divine Revelation. Some of these revelations, such as “that women were originally designed to give birth out of their sides and that there are nine members of the Godhead” distance him considerably from conventional Christian teachings (Peters 2009:2; Stewart n.d.). In recent years, Hinn has increased the prominence of Gospel teaching in his services despite lacking formal education or ministerial training. He has also issued a number of prophetic statements, such as predicting an imminent endtime and the destruction of homosexuals, which subsequently were not confirmed. At the same time, however, Hinn does not claim to personally possess any prophetic or healing capabilities, but rather he asserts that God speaks to and acts through him (Fisher and Goedelman 1996). Healing services are at the heart of Hinn’s ministry, and they rely heavily on the Prosperity Gospel and Word of Faith doctrines, which have now spread worldwide (Hunt 2000a, 2000b). In North America, this tradition is represented by figures such as Kenneth Hagin (widely regarded as the “father” of Word of Faith movement), Kenneth and Gloria Copeland, Rodney Howard Brown, and Paula White. Word of Faith doctrine teaches that spiritual knowledge is ultimate truth and is superior to empirical or sense knowledge. In some strands of the tradition, upon which Hinn draws, God established certain rights for all humans at the time of creation, and God honors those rights. The rights, which were lost at the Fall of humankind, may be regained and activated in the present day through prayer and the force of faith. God will grant believers personal health (physical, emotional, or relational) and prosperity if they express committed faith through “positive confession.” As Hunt (2000a:74) summarizes the doctrine, “the teachings insist that God provides for their physical and material needs, along with their spiritual needs, if His commandments are heeded and there is sufficient faith.” Examples of common positive confessions related to prosperity include “I’ll never be broke another day in my life,” I am expecting supernatural increase this week,” and “I am expecting supernatural debt cancellation this week” (Harrison 2005:4). The pivotal ritual events organized by Benny Hinn Ministries are faith healing services. Hinn began shaping his preaching technique after founding the Orlando Christian Center in 1983. Prior to conducting healings, Hinn would dramatically recite scripture in a manner sources have compared to “tent revival meetings of the 19th century,” often also speaking in tongues. He later abandoned glossolalia when his services began to be televised (Bloom 2003:5). Hinn then enters the stage to the strains of the spiritual song “How Great Thou Art.” An animated Hinn moves around the stage announcing the presence of God and the healing potential in the building. He also typically speaks of the current and future state of a sinful world, often noting or predicting natural disasters and disease that are signs of God’s displeasure with human sinfulness. Hinn offers protection to those with faith in the power of the Lord (Bloom 2003:5; Nickell 2002). At some services Hinn has gone into a trance-like state during which he has proclaimed that God is speaking to him, that angels are present in the room, or that demons are flying out of the building. Hinn invites individual members of the audience on stage for personal healings as well. The persons to be healed will provide a quick synopsis of the condition for which they seek cure. Hinn responds with a prayer or short sermon-like comment. One of Hinn’s “catchers” then stands behind the person as Hinn touches the person’s forehead or holds his or her face between his thumb and forefinger. The person being healed usually falls to the stage floor, sometimes lying motionless and sometimes trembling. The person being healed may then get up and demonstrate some sign of their healing, such as jumping or running around the stage. Hinn conducts several dozen personal healings during each service. It is commonplace for members of the congregation to be slain in the spirit during the service. In addition to healing services, Benny Hinn Ministries offers internet prayer services. These services, often termed “ePrayers,” have been made available to anyone and can be used with any electronic device with internet access, including computers, tablets, and cellular smartphones (Cooper 2014). The Benny Hinn Ministries’ “Prayer Request” form can be accessed from the homepage of the organization’s website. It requires the user to fill out basic information, such as his or her name, country, and email address before focusing on the prayer itself. The user must identify for whom the prayer is being submitted and, from a dropdown box, choose the general nature of the prayer request. The box includes an alphabetized list of “needs” from alcohol and drug abuse, to various illnesses, to “the current world situation” (“Prayer Request” 2014). Located below is a box labeled “Prayer Details” where, using a maximum of 1,000 characters, the person submitting the prayer is able to elaborate upon the request. Upon submitting the prayer, the request is documented on a separate webpage, where it can be seen by any given member of a group of Benny Hinn Ministries’ affiliates titled the Mighty Warriors Prayer Army (MWPA). The MWPA consists of a group of volunteers whose specific and sole responsibility is to fulfill online prayer requests. MWPA members are volunteers who agree to several terms and conditions outlined on Ministries’ webpage. These include a vow to pray at least fifteen minutes per day for those who seek prayer assistance through Benny Hinn Ministries; for Benny Hinn, his family, and the Ministries; for the nation and government; and for fellow “prayer warriors” (Hinn 2014). Hinn claims that with thousands of MWPA members worldwide, prayer requests are fulfilled twenty-four hours per day. However, Hinn has also addressed a larger goal than simply creating a platform for easily-accessible prayer services. He has called for the creation of a prayer community so vast and effective that it will precipitate divine intervention, predicting that “millions will be swept into the kingdom of God and His power will be unleashed for the miraculous as never before” (Hinn 2014). Benny Hinn began preaching in Toronto , hosting prayer services and eventually a local television show. 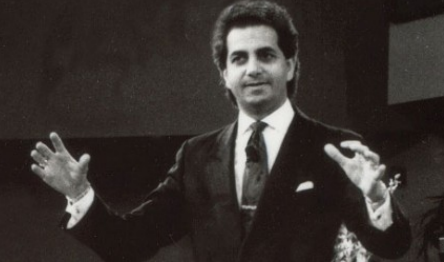 His success led him to Orlando, Florida, where he founded the Orlando Christian Center in 1983 and began to build his ministry (“Biography: Benny Hinn” n.d.). The church grew rapidly almost immediately and soon required multiple Sunday services to accommodate the growing number of worshipers. Hinn began undertaking Miracle Crusades in the latter half of the decade, holding healing services in large venues across the United States, and later internationally, attracting tens of millions annually (“Benny Hinn Author Profile” n.d.). Benny Hinn’s celebrity status expanded even further following the success of his television show, “This Is Your Day,” which began airing in 1990 on the Trinity Broadcasting Network. At its peak, Hinn’s Center in Florida attracted audiences of over 10,000. However, as his tours gained momentum, Hinn spent more and longer stretches of time traveling (Okello-Kampala 2007). In 1999, Hinn handed over the church to Clint Brown, “while retaining legal ownership of the ‘World Outreach Center Benny Hinn Ministries.” He moved his headquarters to Grapevine, Texas where he claimed God had told him to construct a World Healing Center in Irving. However, the center was never built, and Hinn and his wife subsequently moved to Southern California. There Hinn began hostin his television show “This Is Your Day” from the Ministries’ owned and operated studio, the World Media Center, in Aliso Viejo. Hinn’s thirty-minute program is broadcast on a number of different television networks, including Trinity Broadcasting Network, the Daystar Television Network, Grace TV, and The God Channel. It airs daily in two hundred countries. He reaches millions of followers each year through his television program, Miracle Crusades, online sources, numerous literary works, and the sale of recorded sermons and healing sessions. Hinn claims to have communicated God’s message to over a billion people during his thirty-year career. Benny Hinn Ministries has faced opposition from three primary sources: governmental and private agencies that are chiefly concerned with religious group financial practices, Christian organizations that have called into question Hinn’s claims of miraculous healing and the validity of his interpretation of the Gospel, and media outlets that have frequently challenged both. Because Word Faith groups are non-denominational, there is no denominational scrutiny of their organizational practices. Throughout his career, Hinn has been under the scrutiny of the Trinity Foundation, a Dallas , Texas based organization that investigates the financial practice of televangelists. In 2005, the organization contacted the IRS concerning Benny Hinn Ministries’ status as a tax-exempt religious organization, claiming that it did not meet exemption guidelines because it is not an actual church. Headed by Ole Anthony, the Foundation posited not only that the Ministries failed to hold regular services, but also that it did not have a stable foundation of directors and therefore lacked legitimacy as a legal religious organization. Further, the Trinity Foundation questioned the appropriation of the Ministries’ supposed $100 million annual income, alleging that Hinn has appropriated money donated to the organization for personal use. At roughly the same time, another “watchdog group,” the Wall Watchers, contacted the IRS with similar allegations regarding Benny Hinn Ministries. According to the Ministries, the IRS responded by sending them a letter that included a series of questions regarding the leadership of the organization, but never conducted a formal audit. Neither the Ministries nor the IRS released Hinn’s response to the letter, but it was reported that the organization cooperated fully and was able to retain its exemption status (Wrolstad 2005; Martin 2005). Benny Hinn Ministries was subject to several such investigations in the following years, perhaps most notably in 2007 when he and five other televangelists were investigated by United States Senate Committee on Finance. On November 6, Senator Chuck Grassley announced the investigation on the grounds that those under scrutiny had abused their tax exemptions for personal gain. The six churches, among them Benny Hinn Ministries, Paula White Ministries, and Creflo Dollar’s World Changers Church, received letters from the Senate committee, posing questions regarding the allocation of church donations and requesting transparency of financial documents. While Hinn initially resisted the inquiry, he eventually agreed to “ fully cooperate…with the investigation and even implemented financial reforms,” and the three-year investigation was closed in January of 2011 (Garcia 2011). Hinn has also faced opposition from a number of individuals and groups, both within and beyond the Christian community, for a reported refusal to join the Evangelical Council for Financial Accountability. The ECFA, with over 1,1000 members, including Billy Graham and Pat Robertson, requires a degree of financial transparency, aiming to “earn the public’s trust through adherence to seven standards of accountability” (“Do You Believe in Miracles” 2004). Paul Nelson, the CFO of the organization, has reported that Benny Hinn’s extravagant lifestyle and secrecy regarding financial documents and funds appropriation in spite of repeated inquiries have “invited IRS scrutiny” (Wrolstad 2005). Hinn has rejected allegations of financial impropriety. For example, The Fifth Estate investigatory team obtained financial records from individuals within the Ministries who stated that they “want the public to know how Benny Hinn spends the money entrusted to him” (“Do You Believe In Miracles” 2004). The records the journalists obtained showed what were deemed extravagant travel expenses as well funds given to Benny Hinn, with no reasons specified. Hinn addressed these accusations by stating that the documentary’s portrayal of his traveling expenses was misleading as it failed to take into account expenditures that were deeply discounted and services that were provided to the Ministries free of charge. Concerns over financial practices have continued. Despite the estimated $100-200 million the Ministries receives annually in donations, in April of 2013, Benny Hinn called upon his supporters to donate $2.5 million, which Hinn claimed would be matched by an undisclosed donor, to lift the organization out of debt (Zaimov 2013a). Earlier in the month, Hinn reportedly asked the attendees, who numbered in the thousands, of a service in Trinidad and Tobago to each donate $100 to the Ministries in order to fund the crusade. Benny Hinn has also been vulnerable to criticism because he never received formal biblical training or education, rather claiming his knowledge to come from the Holy Spirit itself. Conservative Christian critics assert that his teaching of the Gospel is flawed, particularly his acceptance of Word Faith doctrines. They contend that Word Faith adherents, such as Benny Hinn, do not preach the Gospel, but rather, they shape the teachings of the Bible to fit their specific purpose, selecting scripture “out of context and apply[ing] it to a personal interpretation which is claimed to have been given by direct revelation from God” (“Benny Hinn” n.d.). One of the most disputed teachings of Hinn and the Word Faith Movement involves the belief that that Jesus Christ died a spiritual as well as physical death in atonement for the sins of humanity and “descended to Hell where He was tortured” before becoming reborn (Peters 2009:2). Critics have rejected this claim, deeming it heretical and asserting that because God cannot simply cease to be, the spiritual death of Christ would prove that he is not God. Another such teaching is the Little gods Doctrine. Taken from Bible passages such as II Peter 1:4 and John 10:31-39, the “Little gods Doctrine” asserts that since God created humans in his exact likeness, believers are actually “little gods,” who, with faith, are incapable of suffering from illness or poverty (Gilley 1999). This Word Faith interpretation contradicts more traditional interpretations of numerous Bible passages, such as Psalms 50:1 and Romans 16:27. These passages state that there is only one God and humans being created in God’s image “means we as humans have the capacity through a saving relationship with Jesus Christ to know God,” the traditional interpretation of the verse. Further, the Little gods Doctrine is rejected because “not everyone who loved and served the Lord walked in perfect health” and that God does not intend his followers to “be physically healed in this life” (Peters 2009:3). Benny Hinn Ministries has been the target of several media investigations. The first occurred in 1993. Conducted by Inside Edition , hosted by Bill O’Reilly, the investigation called into question the legitimacy of Hinn’s healings, following up with individuals who had supposedly been healed at one of Pastor Benny’s services. The report stated, for example, that a man who apparently had been miraculously cured of brain cancer on stage found that the tumor was still present after an examination by his doctor; a woman who believed she had been cured of lung cancer refused medical treatment and died two months after she attended a Benny Hinn healing service in Houston; and the doctor of a woman “cured” of deafness reported that she had never actually been deaf at all. Following the airing of this investigation on March 2, 1993, Hinn made a number of media appearances, including an interview on the 700 Club with Pat Robertson. In that interview he vowed to make changes in his ministry, acknowledging the mistakes he had made. In the same year, Ole Anthony of the Trinity Foundation traveled to Florida to interview Hinn. Hinn asserted that he would begin medically verifying all miracles prior to airing them on his program and that he would return to teaching the Gospel. However, shortly after the dust had settled, according to Ole Anthony, Hinn was “back to his old tricks” (Bloom 2003:8). A number of similar investigations were conducted by media programs, including a 2001 documentary aired on HBO titled “A Question of Miracles,” in which reporters followed up on 76 putative healings that occurred during a service in Portland, Oregon. Despite having claimed to possess medical verification for the healings, Hinn withheld the documentation. Several months later, Hinn produced only a list of five names. Upon conducting follow-up interviews with the crusade attendees and their medical examiners, the reporters found results similar to those of the Inside Edition investigation. Another such investigation was conducted by Dateline at a Las Vegas healing and again, the crew tried to contact the five individuals, whose names were provided by Hinn, who reportedly had been healed. Four refused to share their medical records and the fifth, a woman who had purportedly been healed of Lou Gehrig’s Disease at a Hinn crusade, had been misdiagnosed. Possibly the largest news media investigation of Benny Hinn Ministries was conducted in 2004 by the Canadian Broadcasting Corporation’s The Fifth Estate. 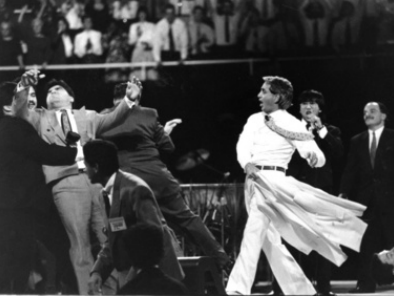 The documentary, “Do You Believe in Miracles,” used hidden cameras and interviews with former Benny Hinn Ministries’ employees and crusade audience members to assess Hinn’s healing claims, as well as to probe his financial practices. The documentary revealed, for example, a screening process by which audience members were carefully selected for appearance on stage. Those who were visibly handicapped physically, for example, were consistently turned away, presumably to avoid disconfirmation. Hinn has responded to allegations regarding his healing practices, stating that it is not he, but God, who heals the individuals; his crusades simply provide a channel through which those who are ill may become recipients of the Lord’s gift. Successful healing requires complete faith in God’s power and not on Hinn’s personal power. Despite the substantial controversy surrounding Benny Hinn Ministries, millions of believers from across the globe flock to his crusades and tune into his daily television show in hopes of experiencing a miracle. “This Is Your Day” is now broadcast in 200 countries, and Hinn undertakes regular Miracle Crusades across the globe. 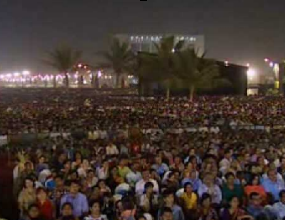 In 2007, Hinn held the largest recorded healing service in history in Mumbai, India, with estimates ranging from five to seven million attendees over the course of the three day “Festival of Blessings” (“Benny Hinn: India Healing Crusade” n.d.). The Ministries receives an estimated $100-200 million in donations annually and contributes heavily to various crisis relief efforts, mission organizations, and schools and orphanages, claiming to “support…over 40,000 children each day” (“How Much Money Does Benny Hinn Make?” (“Salary & Net Worth” n.d.). Hinn also recouped some stature within the Evangelical community when he remarried his former wife in front of an audience of over 1,000 (Zaimov 2013b). “Benny Hinn” n.d. Biblical Discernment Ministries. Accessed from http://www.rapidnet.com/~jbeard/bdm/exposes/hinn/general.htm on 25 May 2013 . “Benny Hinn Author Profile.” n.d . New Release Tuesday . Accessed from http://www.newreleasetuesday.com/authordetail.php?aut_id=496 on 25 May, 2013. “Benny Hinn: India Healing Crusade.” n.d. 700 Club . Accessed from http://www.cbn.com/700club/Guests/Bios/Benny_Hinn_110404.aspx on 25 May 2013 . “Benny Hinn Ministries” n.d. Apologetics Index . Accessed from http://www.apologeticsindex.org/h01.html on 25 May 2013. 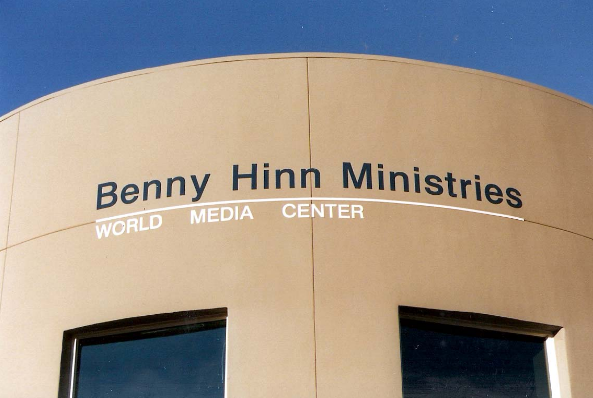 “Benny Hinn Ministries – World Media Center.” n.d. Patch. Accessed from http://alisoviejo.patch.com/listings/benny-hinn-ministries-world-media-center on 25 May 2013. 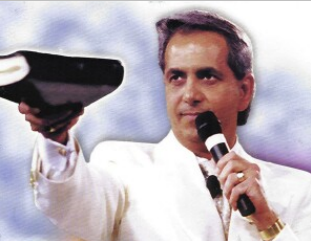 “BIOGRAPHY: Benny Hinn.” n.d. The Fifth Estate. Accessed from http://www.cbc.ca/fifth/amazinggrace/hinn.html 25 May 2013. Bloom, John. 2003. “The Heretic.” The Trinity Foundation. Accessed from http://www.trinityfi.org/press/heretic.html on 26 May 2013.
Cooper, Travis. 2014. “ePrayer and Online Prayer Rituals.” In The Materiality of Prayer, edited by Anderson Blanton. The Social Science Research Council. Accessed from http://forums.ssrc.org/ndsp/2014/01/13/eprayer-and-online-prayer-rituals/ on 22 January 2014. “DO YOU BELIEVE IN MIRACLES?” n.d. The Fifth Estate. Accessed from http://www.cbc.ca/fifth/main_miracles.html on 25 May 2013. Garcia, Elena. 2011. “Benny Hinn Sued by Publisher Over Alleged Relationship with Paula White.” The Christian Post, February 18. Accessed from http://www.christianpost.com/news/benny-hinn-sued-by-publisher-over-alleged-relationship-with-paula-white-49060/ on 26 May 2013. Harrison, Milmon. 2005. Righteous Riches: The Word of Faith Movement in Contemporary African American Religion. New York: Oxford University Press. Hinn, Benny. 2014. “Mighty Warriors Prayer Army.” Benny Hinn Ministries . Accessed from http://www.bennyhinn.org/mwia/ on 22 January, 2014. Hunt, Stephen. 2000a. “Dramatising the ‘Health and Wealth Gospel’: Belief and Practice of a Neo-Pentecostal ‘Faith’ Ministry.” Journal of Beliefs & Values 21:73-86. Hunt, Stephen. 2000b. “’Winning Ways’: Globalization and the Impact of the Health and Wealth Gospel.” Journal of Contemporary Religion 16:88-105. Martin, Allie. 2005. “Benny Hinn the Subject of IRS Inquiry.” AgapePress. Accessed from http://www.ministrywatch.com/pdf/article_071205_hinninvestigated.pdf on 25 May 2013. Nickell, Joe. 2002. 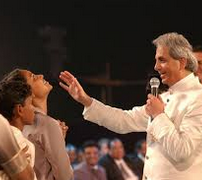 “Benny Hinn: Healer or Hypnotist?” Skeptical Inquirer. Accessed from http://www.csicop.org/si/show/benny_hinn_healer_or_hypnotist/ on 25 May 2013. Okello-Kempala, Raphael. 2007. “ Uganda : Benny Hinn Has a Gift for Country.” Accessed from http://watchmanafrica.blogspot.com/2007/05/pastor-joseph-serwadda-says-benny-hinn.html on 25 May 2015 . Peters, Justin. 2009. “Benny Hinn.” Watchman Fellowship. Accessed from http://www.watchman.org/profiles/benny-hinn/ on 26 May 2013. “Prayer Request.” 2014. Benny Hinn Ministries. Accessed from http://www.bennyhinn.org/prayer/prayer-request on 22 January 2014. Stewart, David J., n.d. “Benny Hinn’s Hidden Heresies.” Accessed from http://www.jesus-is-savior.com/Wolves/benny_hinn-hidden.htm on 25 May 2013 . Wrolstad, Mark. 2005. “IRS questions Hinn’s Tax-Exempt Status.” The Dallas Morning News, July 6. Accessed from http://trinityfi.org/press/hinn07.html on 25 May 2013.
http://www.christianpost.com/news/benny-hinn-asks-followers-for-2-5-million-to-get-out-of-debt-94822/ on 26 May 2013. Zaimov, Stoyan. 2013b. “Benny Hinn Remarries in Front of 1,000 People.” The Christian Post, March 4. Accessed from http://www.christianpost.com/news/benny-hinn-remarries-in-front-of-1000-people-91218/ 25 May 2013.